Furniture is the Better Business Bureau’s 7th highest complaint category. We must do better. Start by addressing prep, delivery & service calls. According to the US Better Business Bureau’s 2008 Complaint Statistics, furniture is the 7th highest complaint category. An interesting additional statistic is that only 72% of the complaints registered against retail furniture companies were resolved. Seven out of the ten top BBB categories had higher resolution and four were resolved in more than 90% of the complaints. As an industry we simply must do a better job to meet customer expectations. One place to start to address this problem is in the warehouse. The January/February edition of FURNITURE WORLD contained a checklist you can use to conduct a basic self-help warehouse and delivery assessment (article is posted to the operations article archives on www.furninfo.com). Using the information gained in that assessment, you can achieve the following five benefits. •Less merchandise sent to your outlet center or dumpster. 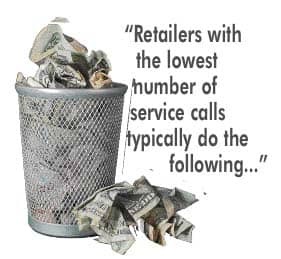 The original thoughts for this article came from conversations with clients and retailers whose warehouse service costs were out of line compared to Performance Group reports and NHFA Retail Performance Reports. The very nature of furniture makes it subject to damage from the time of manufacturing through the factory, warehouses, transit, handling at the distribution center, storage and delivery. You can be your own worst enemy by cutting corners in warehouse, prep and delivery. Do you know what each service call costs your company on a fully allocated basis? A mid western firm doing their own service work had fully allocated costs averaging $65 per stop several years ago. Full cost per stop is now approximately $75. If you are located in an urban area the costs may be much higher. Think of a typical real world example of a problem discovered by your customer after the delivery truck departs. The whole service process may start with a phone call to customer service. 1. From the customer’s explanation it sounds like a problem that a service tech can handle at the home. 2. An appointment is setup with the customer. This is an inconvenience to the customer. 3. At this point, if the repair can be done on the single in-home visit, the matter is closed except that the customer will remember the furniture wasn’t a perfect delivery. 4. If the piece must be taken back to the shop, a pickup must be scheduled, once again inconveniencing the customer and incurring expense. It has to be safely handled, processed to the shop, evaluated, repaired (possibly delayed due to needing parts) or a total replacement ordered. 5.The final step is scheduling the delivery at the convenience of the customer. You can be assured that the customer will do a very careful inspection on the second delivery. The fully allocated cost of an out of home repair can easily exceed $300. In many instances, the repair cost exceeds the gross margin on the piece of furniture. Deluxe and/or repair as needed. Problems are resolved promptly and professionally. There isn’t a cookie cutter solution for every retailer. Processes must be tailored to the facility, merchandise price point and company business strategy. Whether you use in-house talent or hire a management consultant, it makes sense to review your entire back-end operation to control costs and improve your delivery and customer service experience. Daniel Bolger P.E. provides operations consulting services to clients throughout North America. FURNITURE WORLD Magazine readers can contact him at bolger@furninfo.com. For more information on this or other transportation, logistics and furniture warehousing topics, go to www.furninfo.com to read all of Dan’s articles.